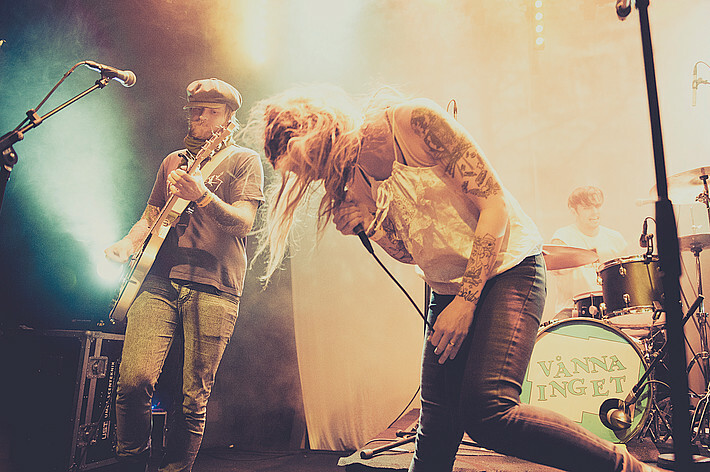 Formed in 2010, Vånna Inget share certain sensibilities with fellow Swedes, Masshysteri and Gorilla Angreb in that they combine minor chords, speed, and death rock guitar stylings with anthemic choruses for perfect sing-along-sadness effect. The strength and mournful catchiness of the song writing coupled with the addition of madchester organ, however, bring them to the next level. Suppose that’s where the Grammy nomination came in. Anyway, their new album, Ingen Botten (translated by our computer as “No Bottom”), reminds us from everything we love about guitar music; from the driving pop aggression of their aforementioned countrymen/women, to darker American melodrama like Concrete Blonde, (late era) Gun Club, and Hex Dispensers. There’s even some Go-Go’s, but we’re talking This Town and “committing infidelity with members of The Specials” Go-Go’s, not the nice ones about going to the beach.